A fearless act of journalism in 1960s Nigeria and the true story behind the international bestselling novel The Dogs of War. The Nigerian civil war of the late 1960s was one of the first occasions when Western consciences were awakened and deeply affronted by the level of suffering and the scale of atrocity being played out in the African continent. This was thanks not just to advances in communication technology but to the courage and journalistic skills of foreign correspondents like Frederick Forsyth, who had already earned an enviable reputation for tenacity and accuracy working for Reuters and the BBC. In The Biafra Story, Forsyth reveals the depth of the British Government’s active involvement in the conflict—information which many in power would have preferred to remain secret. General Gowon’s genocide of the Biafran people was facilitated by a ready supply of British arms and advice. Still tragically relevant in its depiction of global affairs, this powerful book also launched Frederick Forsyth to literary stardom by providing him with the background material for The Dogs of War. The dramatic events and shocking political exposures, all delivered with Forsyth’s bold and perceptive style, makes The Biafra Story a compelling lesson in courage. Frederick Forsyth has written a succession of major best sellers, many of which have been turned into box office blockbusters. Dogs of War, The Fourth Protocol, The Day of the Jackal, The Deceivers to name but four all bear the stamp of his masterly story telling and thorough research. Half war its starting to get bogged down. I am dis appointed. His stories read well and easily, there must have been a formula that he applied. I wish to learn it and will write 20 books for the next generation. It has been 50 years since the BIAFRA outrage. It does well to remember this crime against humanity and the responsibility that must be carried by the Wilson government, in the United Kingdom, and SHELL/BP throughout he 3 year war that cost he lives of over 1,000,000 children. 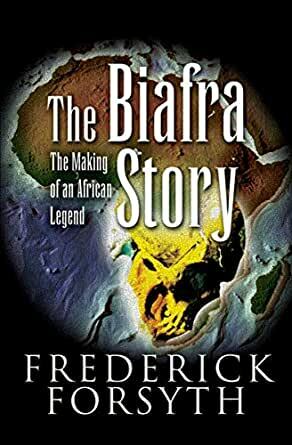 Frederick Forsyth has written to only inside view of the conflict, having live in Biafra during the conflict. I was there and flew small aircraft against the Russian-sponsored jet fighters/bombers, eliminating this threat so relief flight could bring in food and medicine. At one point, 10,000 were dying from starvation per day. The Biafrans have never forgotten, never forgiven those who attempted genocide upon them. I attach a Nigerian government photo of me destroying a Mig-17 May 22, 1969 Port Harcourt, Biafra. I cannot claim to be a scholar of African history, but from the works I have read on the Biafran conflict I find this certainly one of the most readable. It has the benefit of being a contemporary account by a then journalist on the scene, and one who knew the chief protagonist, General Chukwuemeka Ojukwu. Studies compiled over the years largely bear out Forsyth's understanding of the conflict, its causes, and the outcome for Nigeria. This is a fraught subject for Nigeria and Africa in general. Unfortunately, for Nigeria, the One Nigeria policy of General Gowon, which General Ojukwu had supported, until well after the beginning of the pogroms of the Hausa-Fulani against the Igbo people residing in the North, led to the consolidation of a state that remains ethnically fractious. This remains true today for many states in Africa, and beyond. Some attribute the rise of Boko Haram to the unremitting of hostility of some in the Muslim North to the progressive entrepreneurial spirit shown by the Igbo and their Eastern ethnic allies encapsulated in what was the Republic of Biafra. That the Easterners were largely Christian converts merely reflects the benefits these people derived from an education in initially missionary schools, but that flourished as Easterners proceeded to establish schools themselves and promote the values of a Western system of education and progress. The spread of a system of Western education, and the skills and values among the Easterners led to their promotion within the colonial Nigerian state bureaucracy, business and intellectual structures. The pogroms of 1966-67 led to Ojukwu's acceptance the decision of the Eastern Region's Consultative Assembly to opt out of the One Nigeria program, and establish the Republic of Biafra. Emefiena Ezeani's "In Biafra Africa Died," and Chinua Achebe's "There Was a Country" both provide substantiation for Forsyth's contemporary view of the conflict. The former is most valuable for the documentation provided regarding the former colonial power's role in the conflict, and the latter a personal memoir of what it meant to be public intellectual in the Biafran republic.I was a young teen during this conflict, and distinctly remember the images of suffering among the Biafrans. To have observed the ongoing struggles within Africa over the ensuing decades between differing ethnicities, religious divisions, and the personal and public political divides is truly disheartening. Perhaps Achebe's and Ezeani's view on the ultimate outcome, the triumph of national and international political corruption and collusion rather than the development of competent national government is most telling. A lesson apparently yet unlearned. I highly recommend this book as a starting point in understanding the Nigerian civil war on the basis of it's being a contemporary account, and as largely substantiated in retrospect. The author is clearly sympathetic to the Biafran cause, but I remain so, too. 5.0 out of 5 starsA very worthy read that could change your vision of human nature! constantly aiding these struggling people of Biafra, you are truly Giants amongst us. To the people of Biafra, I salute you and apologize on behalf of the whole human race for the atrocities that you were all subjected to. I hang my head that at the time I did not know, or do more to help.